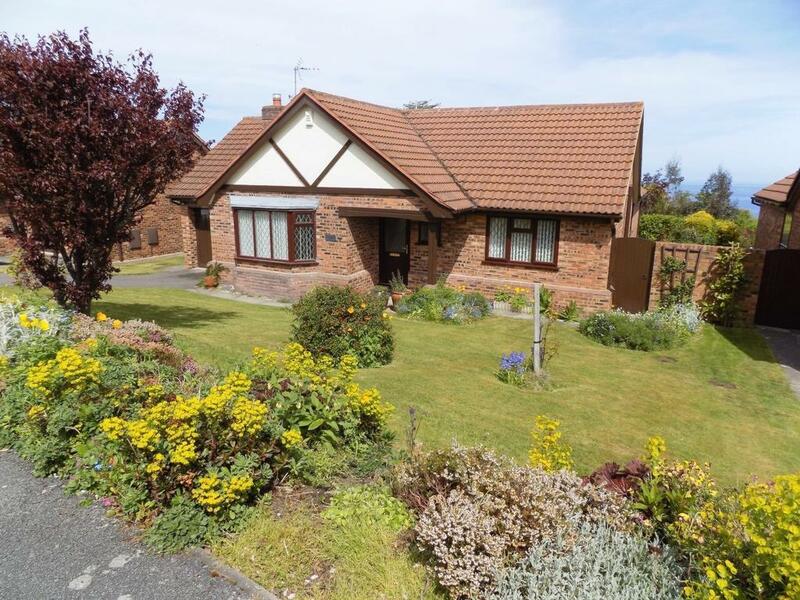 Offered for sale for the first time in since originally built, nu:move are delighted to offer for sale this spacious 3 Bedroom Detached Bungalow which enjoys a setback position within the popular but quiet, exclusive residential cul-de-sac of Rhodfa'r Grug, Old Colwyn. Constructed in 1987 by award-winning developer MacBryde Homes, this classic designed home is 1 of only a handful of Bungalows constructed within this well maintained development. Deceptively spacious, this delightful home is well-proportioned and set within a generous sized plot and from its elevated position from the rear, this property enjoys far reaching coastal sea views. Accessed via the driveway that provides ample private parking for multiple vehicles and leads you to the front entrance of the property. From the welcoming Hallway, you are guided through to the spacious semi-open plan living space incorporating the Lounge and Dining Room where the double glazed patio doors pour in the sunlight and providing beautiful views along with access to the rear garden. The fully fitted oak Kitchen benefits from a good range of wall and base units and overlooks the patio area of the rear garden. The separate Utility Room is a welcome addition and also provides handy access to the rear of the property. Light and airy, the hallway leads to the 3 bedrooms with the Master Bedroom benefiting from a shower room en-suite with beautiful garden and distant coastal sea views. There is also generously sized family bathroom and an additional cloakroom W.C. The generously sized mature gardens to the rear of the property are mainly laid to lawn, this beautiful garden has been a pride and joy over the years resulting in a much loved and varied selection of mature trees, pretty bushes and shrubs within the rockery and tidy boarders. Leading from the dining room there is also an ample sized elevated paved terrace area benefiting from beautiful far reaching sea views to enjoy the summer evenings. This spacious garden provides a good degree of privacy from its peaceful surroundings. The garage is a good size and provides ample storage, benefiting from lighting and power with up and over door and the benefit of the rear access door which leads onto the garden. There is also further access to the rear from the 2 wooden side access gates. Conveniently situated to take full advantage of all the local amenities Colwyn Bay has to offer just a few minutes' drive away including: Bay View Shopping Centre, Supermarket, Dentist, Doctors Surgery and Chemist, Restaurants & Cafés are also plentiful. Leisure facilities also include the Leisure Centre with swimming pool, Theatre/Cinema, Cricket ground, Squash Club, and of course the beautiful blue flags sandy beaches and promenade. Good Primary & Secondary Schools are also close by. The Victorian town of Llandudno is also only a short drive away offering Blue Flag Beaches and Pier, Theatre and Golf along with further leisure facilities and shopping outlets Colwyn Bay offers good public transport links via numerous bus services and by train from Colwyn Bay train station. Easy access routes are available via the A55 expressway which provides easy access to Chester, Liverpool and beyond via the motorway network.